The Brewing Forum • View topic - Ag 33.... another split brew. I'm brewing today. Another split brew as is standard for me. Bittering hops are galena (26g) and Warrior (28g) to give an ibu of about 30. All of them will be fermented with us05. Any wort that it left over will be fermented at cellar temperature. I'm just about to add by sparge water to the mash tun having drained the first runnings. Re: Ag 33.... another split brew. So it looks like I have put less grain in my mash than expected... but its not too much down. Pre boil gravity of 1.044. My mini mash is done and boiling away nicely, with 100g of rye crystal and 60g of dark crystal. I'm still undecided about how much candi to put in it. I’d go easy on the Candi sugar as you’ve not really got a very high OG, so you could end up with a thin beer. I've only just seen it. I put 150g in the mini mash which went into about 22 liters. I didn't measure the gravity of this fv. The final og of the main wort ended up at 1.045 despite a long boil.... I'm not sure how that works! I've added another 150g of dark candi rocks to the darker one. This time dissolved in a little bit of water. I need to dry hop the others, but time is critical. We are selling the house so SWMBO doesn't want beer conditioning in the house when people are viewing. But the fvs in the cellar are fine! I dry hopped these today. The earl grey fv had 60g of earl grey tea, 13g of Simcoe pellets and 8g of cascade concentrated pellets. The APA had the rest of each packet. So 42g of the strong cascade pellets and 8g of Simcoe. I will get it all bottled up a week today.... Hopefully! I got the Apa and Earl grey ipa parts of this bottled up last night. I got about 46 apa and 49 ipas (in 500ml bottles). It tasted clean, fresh and hoppy! I'm looking forward to it being ready. I'll get the rest bottled start of next week. Just in time for the wedding, 60gs of tea is quite a bit I'm intrigued how tea like it is and how much caffeine gets through. Via fruit tea's you could do some mad stuff methinks. Did the colour darken much. There didn't seem to be much colour difference between the apa and the ipa. This one has at the moment quite a strong earl grey flavour, and it's the most I've put in for a dry hop, but I normally put some in the fv (20g steeped over night in about 500ml of cold water) at the start of fermentation. But I didn't do that this time as I'd run out of tea! It's a really nice beer and easy to make! Cheebs had a go at it a while ago and seemed impressed. Brewzee wrote: Just in time for the wedding, 60gs of tea is quite a bit I'm intrigued how tea like it is and how much caffeine gets through. Via fruit tea's you could do some mad stuff methinks. Did the colour darken much. 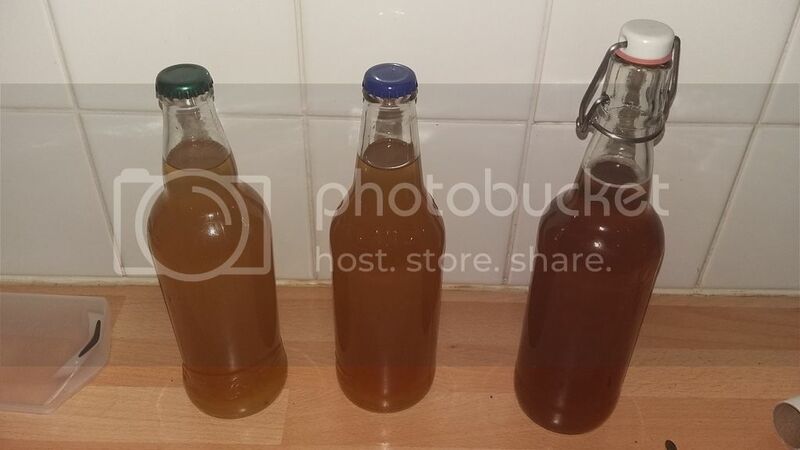 Here is the finished product in bottles. Green top is the apa, blue top is earl grey ipa and the kilner style top is the darker one.... although it's more of an amber really! With a side by side the ipa is a bit darker than the apa! And as you'll see I've bottled the darker fv up as well! Got 43 500ml bottles... and it appears to have dropped to 1.006. Slightly fruity weird taste to it. Should be interesting to see how it turns out. These are being drunk now. The apa is very nice.The earl grey ipa is good but will take a few more weeks to get to its idea condition. Both have a good ckean vrisp malt back bone, a good flavour from the dry hopping and a nice long dry finish. The amber is also nice it's got a fruity edge to it and is quite easy drinking for 6ish %. Maybe lacking a bit of body but I knew that would be the case! All have been much enjoyed by my family at a get together this weekend!